Estimating painting costs can be a tricky part of any contractor’s work, given the myriad factors in play. Obviously, you can’t leave it to chance or you’ll find yourself over or under-charging for jobs. That’s where professional software programs like PEP Cloud make sense to incorporate into your business operations. By eliminating the guesswork and providing fully formatted, professional, and binding estimates to your prospects, you can improve your profits, reduce your headaches, and keep your employees and your clients happy. Not convinced? Consider how many factors contribute to the total cost of a paint job, and the variability, which can significantly skew the final outcome, when estimating painting costs. From a cost standpoint, paint is a deceptively small part of the overall costs since it only constitutes approximately 15% of the final tally on most paint jobs. Unless the home’s on the market and expected to be in other hands sooner rather than later, it’s definitely not worth it to cut corners on paint product quality—go for high quality, durable, and long-lasting paints. It’s better for you and better for your clients. No matter how good the paint, how efficient your tools, or the technology you use, you will still need to pay your employees or sub-contractors to paint. Even if you’re a one-person show and perform all the work yourself, the value of your time needs to be accounted for in the costs of the job. You should always expect labor to be the most expensive part of the job. 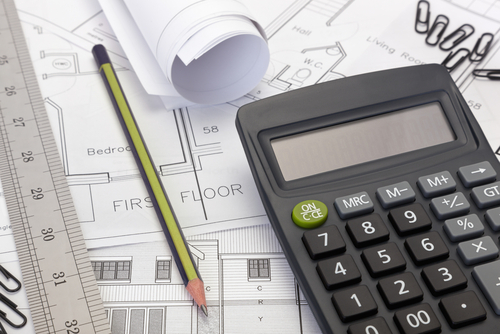 Here’s where estimating painting costs can become complicated. Depending on your company, overhead could be significantly different depending on the location and the types of jobs you are being hired to complete. Factors such as the number of part-time employees and full-time employees on a job, state regulations, benefits, and worker’s compensation insurance all play a role in determining your overhead on a particular job. For example, exterior painting jobs are more expensive for worker’s comp compared to only performing interior painting jobs. There are also other insurance requirements for liability coverage, the number of vehicles in use, the equipment you own, and if removing lead from homes painted before 1977. Advertising and marketing budgets must be considered and factored into the costs of operating your company depending on your business goals. For example, if you are just starting your business, marketing will be critical to growing your business. When you make a sale to do a paint job, you need to consider the cost of getting that job in the first place and lead generation for subsequent jobs. Having a strategy to prospect and find new leads requires defining a marketing plan and budget to implement the strategy. Budgeting the variable and fixed costs for supplies and equipment can be difficult, because different types of jobs can have such varied requirements. Painting an older (before 1978) single story home covered in lead paint requires completely different supplies and equipment compared to a newly constructed home. The business must also supply all major tools for all paint jobs including the ladders, sanders, sprayers, scaffolding, caulk guns, brushes, and special equipment needed for lead removal. Electronic lifts and aerial boom vehicles which rise to 60 feet may be required to safely and efficiently do high elevation projects such as exterior buildings painted with lead. The EPA and federal government mandate lead testing for employees and that blood tests be done yearly. If positive, the employee would not be able to work on lead jobs until a negative test result and would require workers comp payout, which needs to be considered in operating budgets. If the home or building was painted before 1978, you must assume the paint contains lead unless you can prove otherwise. And the penalties for not complying with these environmental laws are $30,000 per day per incident. Unless you’re going to avoid jobs involving lead-painted homes, dealing with lead safely and in compliance with federal law needs to be a major consideration when you’re estimating painting costs for these types of jobs. Additional costs include the hepa filters, vacuums and bags, lead removal systems with the power tools, which hook up to these systems, and the additional insurance costs. There are also training requirements and certifications to be qualified to remove lead safely. For example, the training can be about $300 / person and $500 to register each person with the state depending on which state you operate your business. To perform the job, the business would need to cover the variable costs for the protective gear required when doing a lead job such as respirators, booties and depending on the job, the business may need to provide more than one set of protective gear per employee per day. The additional budgeting requirements for lead jobs are easily considered using paint estimating software like PEP Cloud. PEP, LLC presents PEP Cloud and PEP Cloud PRO as the leading edge estimating and business management cloud-based software program designed by a painter, for painting contractors. PEP Cloud is a strategic business tool that guides you in constructing a professional, legally binding proposal and contract for your clients which is quickly and easily delivered electronically for the convenience of all parties. PEP Cloud PRO, is designed to aid you in keeping your business organized, allowing you to easily track your jobs and clients, manage your employees, and correctly calculate your fees and expenses of all jobs, so you can achieve consistently the profitability you require. PEP Cloud and PEP Cloud PRO will help take your business to the next level and demonstrate the professionalism you desire for your company. Call us to schedule a demonstration of PEP Cloud and PEP Cloud PRO painting management software or sign up here to show you how estimating painting costs is done with PEP Cloud and PEP Cloud PRO; and why it is critically important to do it right for the profitability of your painting business.